Congratulations to Colby for completing Low Impact Development (LID) training and receiving this certificate from WSU! 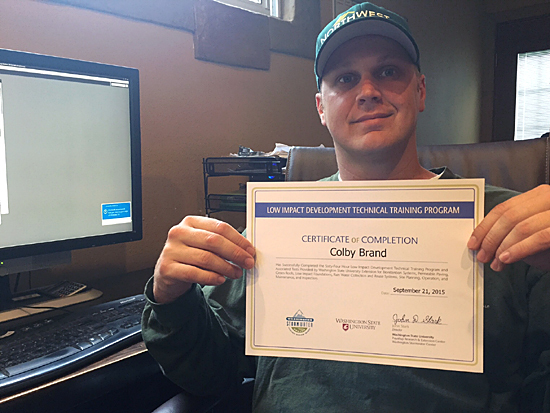 Colby proudly displaying his Low Impact Development Technical Training Program Certificate of Completion. The WSU Extension Low Impact Development (LID) Certificate program is the first LID certificate program of its kind in Washington State. The certificate indicates that Colby has received the latest design concepts for LID practices; has a level of technical knowledge necessary to recognize design opportunities and challenges; and is better equipped to optimize LID systems. Kitsap County defines LID as “a stormwater management strategy that mimics natural drainage systems at or close to the point of generation in order to limit potential contact with pollutants and enhance stormwater quality.” In short, LID practices protect our local water quality and groundwater supply, and preserve wetland and stream functions. He also passed each subject’s test with flying colors! To learn more about this LID certification program, click here.